I went to The Farmhouse Show (in Turner, Oregon) for the first time, ever, even though I've been hearing about it for some years. (I'd actually never even been to Turner.) I found some great pieces....well, I found a ton of wonderful things (yes, probably actually one ton), but I only bought a couple of handfuls. I love how people are using these double- or triple-tiered baskets in their studio/craft rooms. They put fat-quarters in them, little bottles of paint, Stickles.... you name it! This one is mostly twisted metal wire, painted and distressed...unless it's naturally distressed....not sure about that. It doesn't matter. I loved it and I've had my eye on one for a few weeks at, of all places, the grocery store! Our grocery store has a lovely little gift section... and a table where they put out seasonal items. There's almost always something that I love on that table! (But, I rarely buy something just because I like it.) Anyway, the one at the grocery store is even more perfect... it's not twisted, it's that lovely "shabby" green and it has a bird on it!! Up on the top!! What more could anyone ask for?? I've told my husband about it and I showed it to one of my daughters, hoping that someone will be so inclined to buy it for me for Mother's Day..... or my birthday. I'll put them on my work-tables up in my "studio", after I finish purging, organizing and getting the work-spaces set up. I've always loved the Shabby-Chic look, but it's never been real defined in my mind... as far as what I like. I like too many things! And, well, life happened and as we had four children, my home sort of decorated itself. Any time I'd clear off a table top or the top of the piano and put nice things up there, a cat would think I made that little space especially for them and climb up there and knock over picture frames and whatever else they could needed to, in order to be comfy and happy. It is all about the cats, after all! Well, I'm working on defining my style. What it is about Shabby-Chic/vintage-y stuff that I love and what I can live without. I started working on an upstairs room that has sort of been a "black hole" for the last nearly-23 years. Yes, we've been in our house for nearly 23 years! I've made great progress but there's still lots to do. And, I'm limited because the roof is pretty steep up there, so the side-walls are only 21" high! :( But, I've got some ideas brewing in my head! I didn't think of taking "before and after" pictures of it until I was about half-way through with the purging! But, that's ok. You'll get the idea. So, back to my finds. Along with the wire two-tiered basket, I found these sweet, little jars with lids! I realize now that it's kind of hard to see them in this photo (in front of the wire basket), but I've already wrapped them up and put them upstairs, where they will ultimately be used, so this picture will have to suffice. Anyway, the useful part of them is only about 2" (at the most!) tall....then the lid makes them maybe 3" tall. I'm envisioning things that I use, but that are loose, being stored in them...out where I can see them. Like buttons, three different colors, each in a separate jar. Something like that. Whatever it is, it'll have to be small! Any ideas? The other thing in that picture is a cloche, which I've been looking for for a while now. I want to do mixed-media pieces and create little vignettes, for holidays/seasons to put in there. But, this one came with something already in it! Two somethings, actually!! There's a doily on the bottom.... (I love doilies made of crocheting cotton thread) and then a little "nest" of sorts. I just loved the colors and when I got home, it went perfectly with the tablecloth that's on my table right now! The last thing I got at The Farmhouse Show was this little, green shelf with pegs on it! I've been collecting these old-fashioned crocheted pot-holders. I went to hang the ones that I'd just purchased a few days before and realized that the pegs that are on the cabinet above my stove are too big for these. :( So, I thought to myself, "OK, so I need to find something that has smaller pegs to put these on." I think it was the next day (maybe the day after that) that I went to this show and found this shelf! A perfect green, with a little shelf above, for sweet little things, and pegs below! And, for under $20.00! Yay!! So, up it went, right after I got home!! And, how sweet is that, with those pot-holders on it?? I went to a much smaller sale on Thursday afternoon...the Country Calico Antiques & Craft Spring Market. I found some goodies there, too, which I will show you later! Both of these shows also happen in the fall. Not sure about the Country Calico one, but I'll definitely be going to The Farmhouse Show in the fall! I hope you're all enjoying the weekend and that all you Mothers out there will be treated like Queens tomorrow!! Happy Mother's Day!! 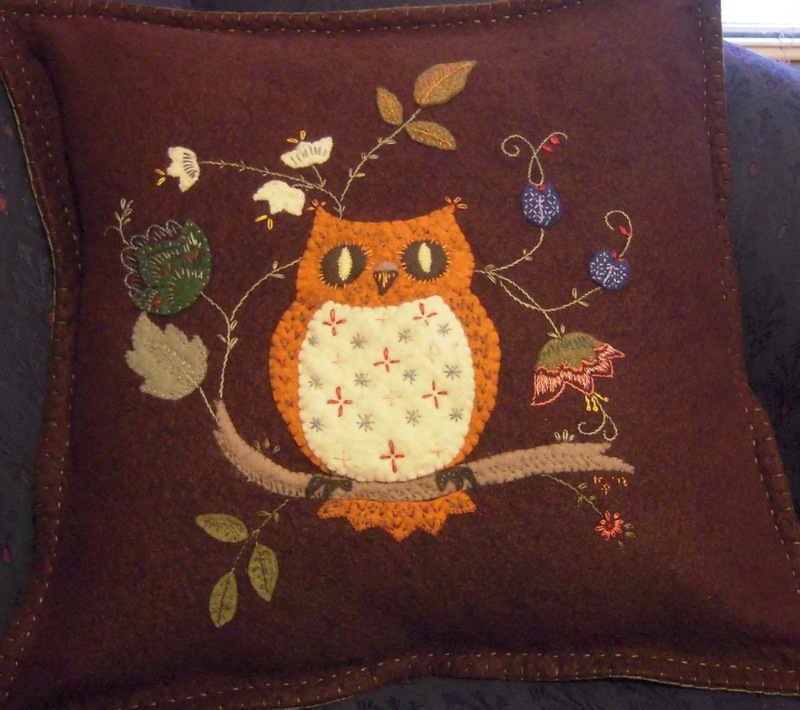 They called him "Mr. Owlie"
But, Beki also loves wool, as I do, and wool-felt. So, I decided to use wool felt on the bigger things and then fill it out with embroidery. I guess I didn't take a picture of the back, but I just overlapped the fabric, by about 4", I think, to create an "envelope" back. I bought some largish buttons and just cut open the wool, to create button-holes. That's one of the cool things about wool.... you don't have to finish the edges! It's not going to unravel! I did a blanket stitch all around the outside edge and then did a running stitch about 1/2" from the outside edge, so that the whole edge would be flanged. On a completely different note, I've always used the word "unravel", to mean something that's fraying. But, just now, all of a sudden, I wasn't sure if that was the correct word. It seems sort of like fiction and non-fiction suddenly! So, I looked it up and, basically, they mean the same thing. Oh, I see the "underline" has finally disappeared! Thank you so much, Blogger, now that I've accidentally deleted the entire button for "underline", since it wasn't responding to my telling it to stop underlining!! UGH. I'm seriously considering leaving Blogger. But, I'm not sure where I'd go or how easy it would be to transfer all my old posts. It sounds a tad overwhelming. I know a lot of you have done this, though, so, please, if you have any recommendations for where to go and how to go about it, please share! I'm doing The Sketchbook Tour for the first time this year! I tried to put The Sketchbook Project gadget on here.... but, no, it just wouldn't take it. Finally, I just saved their logo and then uploaded it here, just like I would a photo, without using html. Very frustrating, though. And, I don't like how they've changed the whole look of everything. Just leave things alone, thank you very much! Anyway, I hope you like the towel... Jana did! And, if you have any ideas about switching to a more user-friendly place to have a blog, let me know!